INCLEMENT WEATHER: We do our best to continue service throughout periods of bad weather. Time lost due to lightning and other weather stoppages will not be added to your final bill. 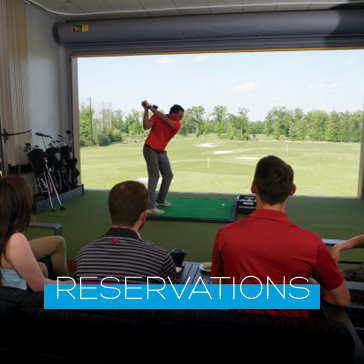 Launchbox Golf is currently accepting reservations 14 days in advance. Reservations will be held no more than 30-minutes after starting time. Each bay has a maximum capacity of 6 guests, whether playing or not. For reservations larger than 6, it may be easy enough to repeat the process. Consecutively numbered bays can be shared. Example: Complete the reservation process for Bay 1, then repeat for Bay 2. For even larger reservations (more than 12 people), tell us what you're looking for in an email to our sales director Kelsey Baron by clicking HERE. Bays 8, 9 and 10 are upstairs, indoor bays. Children under age 16 must be accompanied, and supervised, by parents or guardians. Starter golf equipment is available for use during your visit, and you are always welcome to bring your own. We are not always able to provide clubs for junior golfers, but will try with advance notice.